Bulimia nervosa is a condition that is characterized by the bingeing of food, followed by an immediate attempt to purge the food from the body because of a fear of gaining weight. During the binge stage, people with bulimia will eat large amounts of food in a very short amount of time. Purging can include vomiting, the use of laxatives or diuretics, and excessive exercise. People with bulimia may engage in a cycle of strict dieting, intense hunger, binge eating, purging to avoid gaining weight, shame and disgust, and the return to a strict diet as a result of body dissatisfaction. Characteristics of someone with bulimia nervosa include disordered perception of weight or shape, unusually obsessive eating behaviors, depression, and isolation from peers or family. People with bulimia may schedule their day around binge and purging episodes. People with bulimia have negative attitudes towards their body and suffer with extreme body dissatisfaction. Bulimia nervosa is a disorder that can be associated with low self-esteem, alcohol misuse, depression and self-harm. People with bulimia feel ashamed of their behavior and may feel guilty, however, the fear of gaining weight perpetuates their continued disordered behavior. Bulimia nervosa is a vicious cycle of guilt and low self worth, and it is important to get treatment and seek help. You struggle daily with low self-worth which is significantly influenced by your weight and body shape. This may have led you to controlling your food intake, or implementing strict dieting rules in an attempt to manage your weight. These rigid rules create feelings of deprivation and hunger, resulting in episodes of binge eating, The bingeing can feel out of control, as eating is fast and takes place in secret. You temporarily allow yourself the freedom to eat all the foods that have been banned, these often being high in fat and sugar. After the momentary relief and enjoyment from eating, guilt and shame may quickly descend, as you compensate through purging, (vomiting, laxatives, diuretics) or non-purging compensatory mechanisms such as starvation or over-exercise. 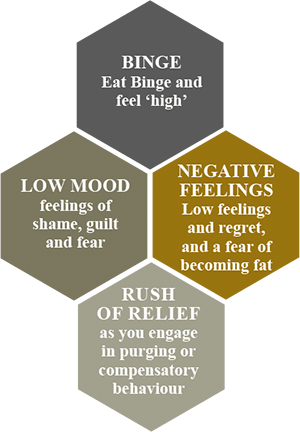 Although initially, this cycle is often triggered by restrictive eating or dieting, it can rapidly becomes a coping strategy for emotional distress. 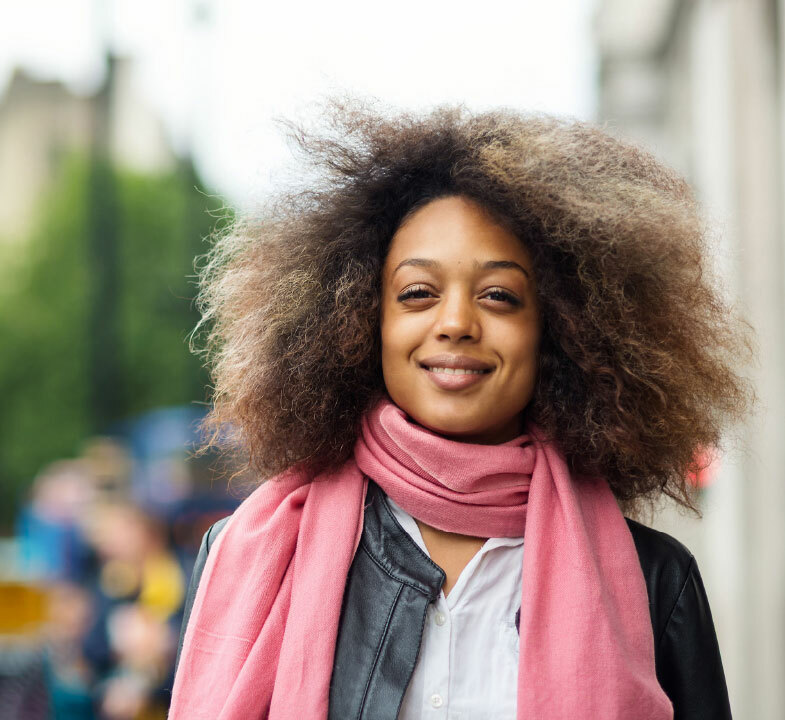 The focus of our bulimia treatment programme is to support you in developing new coping mechanisms to deal with life’s ups and downs, so you no longer need to turn to bingeing and purging as a way of coping. We will look at the triggers that cause you to binge eat, teach you new ways to manage your emotions away from food, and support you in developing new thinking styles to deal with life in a positive and empowering way. We will explore themes from your past that may be keeping you trapped in the cycle of bulimia, working through any unresolved feelings that may be blocking you from living life in a free and happy way. Focussed short-term therapy can help in the reduction of symptoms and offer you lots of skills, tools and tips to support you in your road to bulimia recovery. 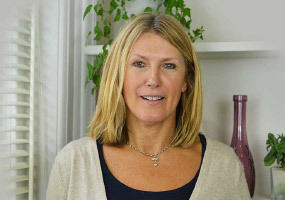 Our 6-session bulimia treatment plan is designed for people on a budget who want to reduce their symptoms and feel better, or for those who have had a relapse and just want to bring some focus and structure back to their eating. For some people, bulimia nervosa may be more entrenched and symptoms more severe. Our experience tells us that longer-term therapy will be more appropriate for this presentation. We will work with you to settle and calm your day-2-day behaviours and symptoms, and at the same time we will explore with you the factors that initially triggered your bulimia in the first place. his deeper work allows us to tackle the limiting core beliefs that lie at the heart of your bulimia and that keep pulling you back to your eating disorder as a coping mechanism. When you understand how and why you decided to use food as a way of coping with your world, the structure inside of you that maintains your eating disorder starts to break down.